Yes, I'm still plugging away at Holiday cards! This is definitely not a card I'll be mass producing, I'll be taking more of a CAS approach as I make that mad dash to finish er, start my cards! I do have a surplus supply left over from last year, but not nearly enough. I think a lot of people have cut back on holiday cards, or maybe they just cut me off their list, as I have not received a lot, just a handful. I'm totally okay with that though, as I will still be sending mine out, hopefully they will all be in the mail by Monday. How about yours, are they done, addressed and mailed? 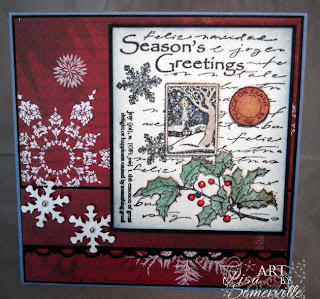 This was one of the cards I worked on while Sue was here the other day for our Monthly Creative Day! Last month I stamped a few of her Hero Arts images when we got together, this month I actually used them! Parts of the collage are popped on dimensionals, all images are colored with Ranger Distress Inks and an H20 Brush. I used Liquid Pearls to add centers to the snowflakes and berries to the holly branch. A touch of DD Glitter was added to the tree/church. 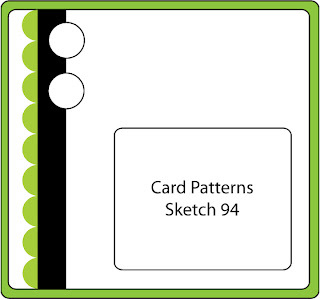 For inspiration I used Card Patterns Sketch #94, rotating the sketch to fit my image. Beautiful! Love the paper you used and the image. Loved the details in the shimmer. Such a cool Christmas card. Love the images!! I am working on Christmas cards and decorating and meal planning!!!! 365 days and now there is only 10!!! Beautiful card! I have 80% of mine mailed but didn't make as many this year. gorgeous card, I don't have mine done yet (I'm not making them) and they hopefully will be mailed by Monday though...once I get them LOL! Beautiful card Lisa! Love the elegant feel to it. I have the same stamp but always had a hard time using it. LOL. 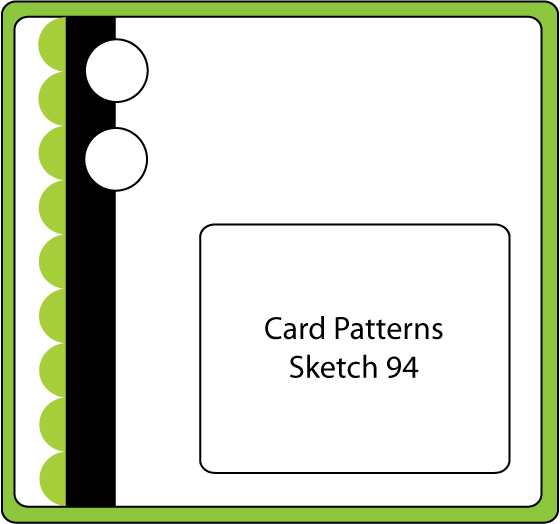 TFS and playing along with us at Card Patterns. Wonderful card. I really enjoyed seeing all your Tim Holtz tags. I haven't started addressing cards yet. Only a select few will get hand made cards this year, the rest of our list gets a family photo card. I have to tell you, you are quite the 'celebrity' in my office. I made your Chocolate Eclair cake for a birthday celelbration at work. Many people asked for the recipe, all of whom I told I got it from you. Everyone raved about it, a couple people told me they served it at Thanksgiving. So, you're becoming a well known cook, at least in Denver!